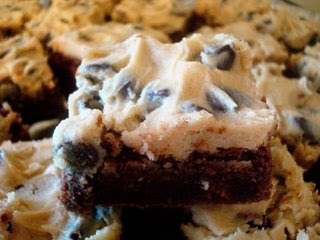 Little Mrs. Married: Cookie Dough Topped Brownie?!!!?! OH. MY. GOSH. Do you have any idea what this is? Well, the bottom half is BROWNIE. And the top part is...get this... COOKIE DOUGH. Brownie & Cookie Dough! Yes! Can you imagine?! I simply HAD to try out this recipe. Especially because Brad LOVES cookie dough. I would rather have a cookie, but Brad would much prefer the cookie dough! Anyway, so, i made them. & Brad was a VERY happy hubby! Yes, i know this isn't the most ideal thing for someone to be eating when they are on a diet. But, thankfully, i am NOT eating it. I am only MAKING it. Actually, okay, i did have one small piece. And it was DECADENT. No other word applies. Here is the recipe for those of you who, unlike myself, can actually afford to eat something like this!! And, i have to tell you, i tried this an hour or so after it was made & i didn't think it was anything special. i mean, it was good, but it wasn't anything to write home about. I know she said to chill, but it didn't say how long, but wow. After leaving it in the fridge all day today & then coming home & tasting it... AMAZING. It's Delicious!!! Preheat oven to 350 degrees. In a medium saucepan over low heat, melt butter and chocolate chips. Stir constantly and remove from heat when chips are fully melted. In the same pot, blend in the sugar. Then add eggs, blending fully one at a time. Add flour and salt and beat until air bubbles form in the batter. Pour into a greased 9 X 13-inch pan. Bake for 20 minutes. Turn heat down to 325 degrees and bake for 10 more minutes. Cool completely and then top with the cookie dough layer. In a small bowl, cream butter and sugars until light and fluffy. Beat in milk and vanilla. Gradually add flour and salt. Stir in chocolate chips. Drop by tablespoonfuls over cooled brownies; carefully spread over top (this can be tricky but I found the best way is to slightly wet my hands and pat the dough down gently so it doesn't pull up the brownies. Cut into squares & chill. Yummy! Sounds delicious! I'll have to give it a try! Thanks for sharing. Hope your play went great!! I heard wonderful things about it! btw, i stole the pic from the kitchencafe website. my brownies looked awful! but they were oh-so-good! LOL...just so you know, I got a kick out of your dramatic self in this blog. Man, I miss you!!!! The woman is the wife of a Missionary, they are originally from Baton Rouge (Steven & Barbara Nicaud), I've tried the Rosemary Chicken, and it is AWESOMENESS!!!! And definitely do 2 birds at once, cause one bird ain't enough, especially if your hubby likes to eat as much as mine!